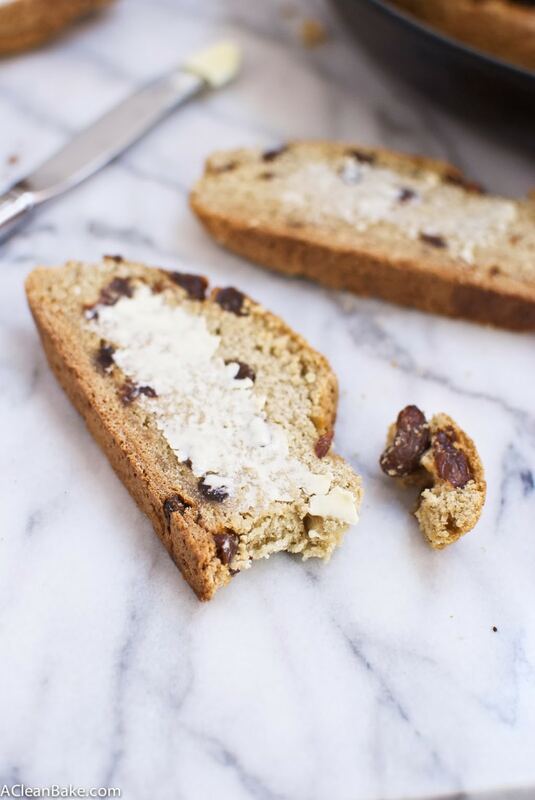 For a grain free version of this gluten free Irish soda bread, check out my paleo gluten free Irish soda bread here! I was going to save this recipe to post on St. Patrick’s Day but I sent it to work with my neighbor and he reported back with rave reviews. Apparently no one noticed that this was gluten free, and everyone wants the recipe. 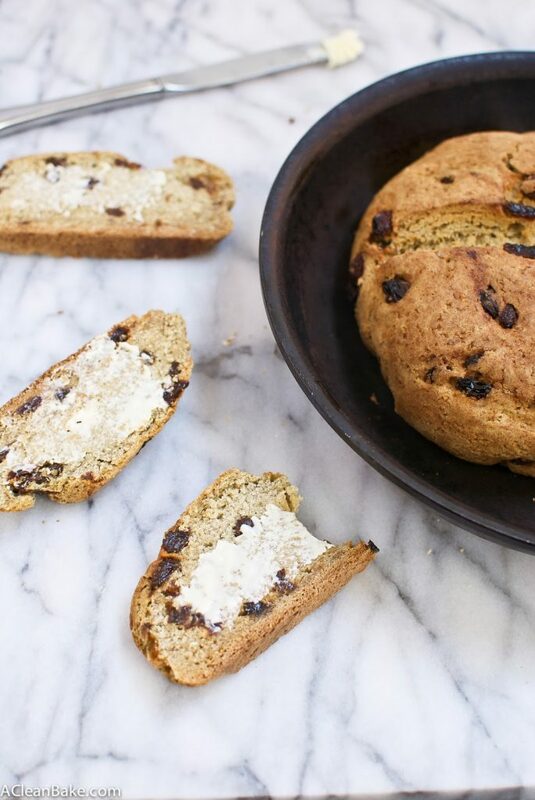 That has been a common reaction to this gluten free Irish soda bread, actually. I shoved a piece in front of Bryan (poor Bryan gets so much food thrust in front of him with no more explanation than “can you try this?”) and he loved it. He asked how I made it and, when I told him, his eyes nearly bugged out of his head. “This is gluten free!?? !” That’s exactly the reaction I was going for. I have been working on this recipe for so long – you’ve probably seen more pictures of it on Instagram than you’d care to – and am incredibly excited to share it with you. One of the hardest things about giving up gluten, whether temporarily or permanently, is that just when you’ve adjusted your expectations of what you can and can’t eat, you’re sideswiped by a seasonal favorite that you forget about until a certain time of the year. I live and die for Irish soda bread in March. 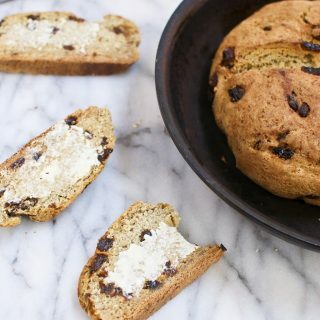 The tender crumb, the moist raisins, the crispy crust and chewy center, the salty sweet bitterness of the salt and sugar and soda all comingling…it’s so worth enduring another month of crazy bone-chilling cold over. Well, maybe not worth it, but at least makes enduring it possible. I knew there was no way that I would be able to get through the month without so much as a slice of the stuff, so this is me getting in front of my complete and utter lack of soda bread self control. And this is you feeding the only craving that is stronger than the ones for emerald green t-shirts, Bailey’s and day drinking this time of year. PS: For those of you who don’t have a pantry full of strange flours, and don’t avoid gluten, I’ve included the conventional (i.e. wheat) version of the recipe below the gluten-free version. Just keeeeeeeeeep scrolling down. 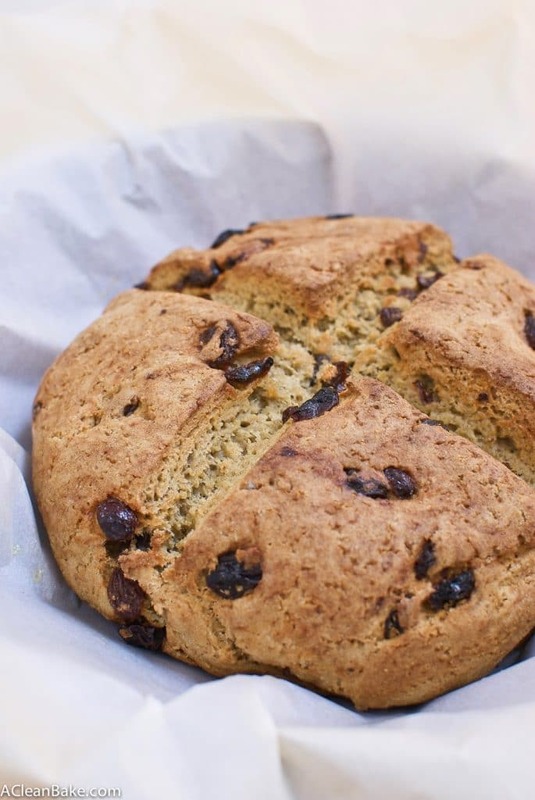 An easy recipe for gluten free Irish soda bread that everyone will love - even your gluten-eating friends! Place raisins in a heatproof bowl. Bring 2 cups water to a boil and pour over raisins. Set aside to soak while you make the rest of the bread. In a large mixing bowl, whisk together the dry ingredients (flour through salt). Stir the melted butter into the dry ingredients and then add the vegan buttermilk until the dough holds together, but isn't too sticky. Drain and stir in the raisins. Gather the dough into a ball, and with your thumbs on the top and your fingers underneath, rotate your wrists to gently pull the dough to for a tight boule with a smooth, tight top. Line a cast iron skillet with parchment paper, and gently transfer the dough into the prepared skillet. Use a sharp straight-edged knife to score a large "x" across the top. Melt another Tablespoon of vegan butter and lightly brush it over the top of the loaf. Bake for 30 minutes at 400F, then lower the heat to 350, remove the loaf from the pan, and bake for another 10 minutes directly on the middle rack. This post contains affiliate links. If you click through and purchase the product, I get a very small commission (as in pennies). All earnings get re-invested directly into running this site. Thanks for your support!